Small control valves are often used in research facilities. Typically, the available installation space is limited in such systems and the dimensions of commercially available positioners are often not suitable for mounting on micro flow valves. For this reason, Schneider Electric developed an external sensor for the new positioner SRD998. This sensor allows for an ideal connection to the Badger Meter small control valves. The existing, patented mounting kit from Badger Meter could be incorporated. Due to the decoupled and self-adjusting coupling, a spring preload of the tap can be dispensed with. As a result, no lateral forces are introduced into the valve guiding. To prevent differences in electrical potential, the connection to the valve system is conductive. The valve and stroke sensor unit are therefore combined and electrically grounded. The sensor is supplied with a pre-assembled cable. The connection to the positioner is made with a screwed plug. This connection avoids exchanging terminals and can be intrinsically safe. The longer pneumatic connection from the positioner to the valve drive is not a factor that needs to be considered. With the normal dimensioning of this compound, the pressure-bearing total volume increases only slightly. The compact design of the sensor makes it much easier to access the packing or other parts of the valve. 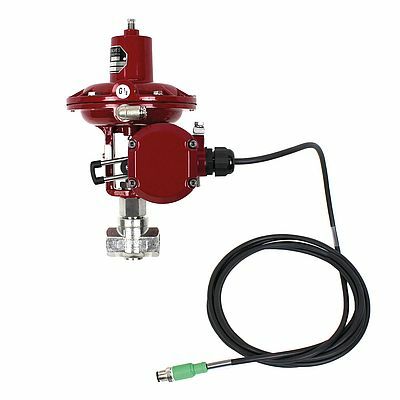 Very good control behaviour, an optimal rotation angle of the potentiometer and small control valve small valve lifts can be achieved. The positioner itself can also be attached to a more suitable point in the system. The visual inspection and operation of the controller is therefore also easier to undertake. This concept has an added benefit in that it can also be applied to other types of positioners. A uniform interface from external sensors to positioners can be created. In the case of very small control valves, a connection to very voluminous, pressure-encapsulated positioners is considerably simplified.